Plenty to do @ Deep Creek State Park! 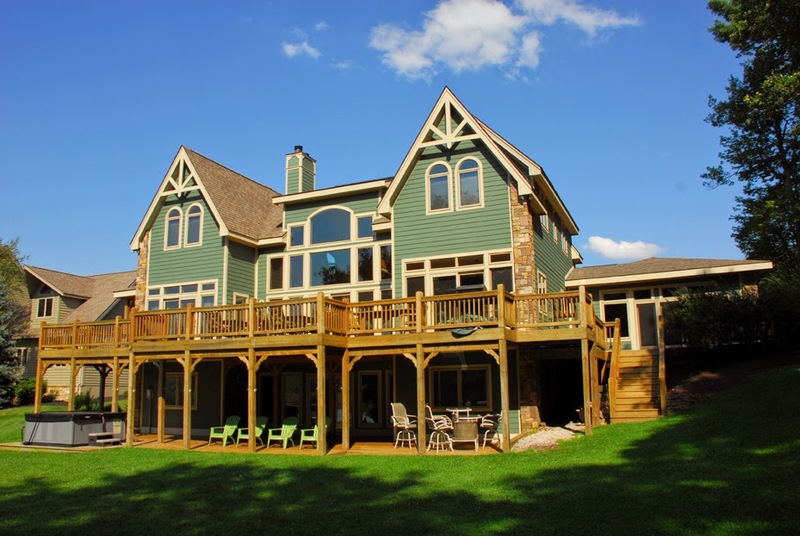 We here at Taylor-Made Deep Creek Vacations & Sales do our best to try to find the ideal vacation home for our guests. While most guests want lakefront homes, others prefer to be on top of the mountain admiring the breathtaking lake views. In this case, they may have to drive to their lake access. While there are many great area beaches throughout Garrett County that they can choose from, one of our favorites is the Deep Creek State Park. With over a mile of sandy shoreline, the park is equipped with picnic tables, grills, shelters (these are great to rent if you have a larger group), a bathhouse, and bathroom facilities making it a great place to spend with the family. This is also where the boat launch is if you bring your own boat to use during your stay. The beach area is very clean and never seems to get crowded so it’s nice for families with smaller children. I usually suggest planning a visit and staying the whole day. The Deep Creek Discovery Center is next door and a wonderful place to bring the children to learn about the natural and cultural resources of our area. Park Naturalists are there using interpretive and fun programs to show a wide range of activities. A list of programs for the month is posted on the bulletin board or you can go directly to the park’s website. http://dnr2.maryland.gov/publiclands/Pages/western/deepcreek.aspx. They even do evening bonfires which are a lot of fun! Wisp Resort is also there offering morning, afternoon, and sunset paddleboard tours! 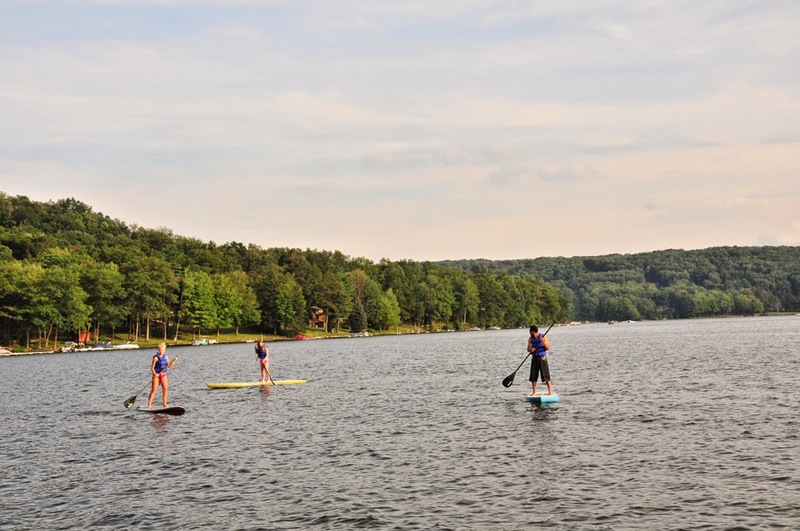 Paddleboarding is one of the newest crazes to hit Deep Creek. Many of our staff members have tried it and give it a big thumbs up! Wisp also offers kayak rentals as well. 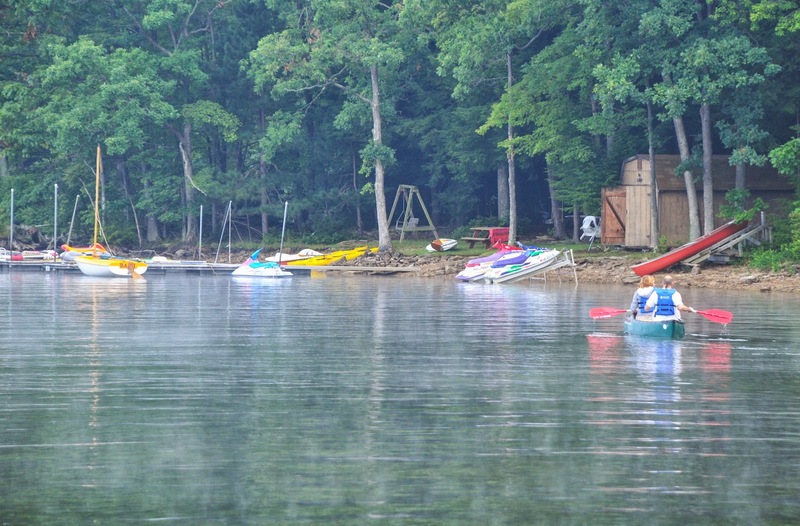 One of the best memories you will have of Deep Creek Lake is taking one day to enjoy it by kayaking in the early mornings. The tranquil setting of cutting across the glass like surface and embracing Mother Nature is not one you will soon forget! So, if you are visiting our area and looking for a place that you and the family can enjoy the lake, we highly recommend Deep Creek State Park! It’s not too late to plan a last minute trip to Deep Creek so call today and we will do our best to help you find that perfect home. Many of our homes are now offering the partial week long stay so if you were concerned because you couldn’t get away for a full week, we have taken care if that problem for you. Give us a call 1-866-351-1119 or online www.deepcreekvacations.comand let us help you plan that much deserved escape! We can’t wait to see you at the lake! It’s Only Fair to Let You Know…. Everyone loves the Ferris Wheel! 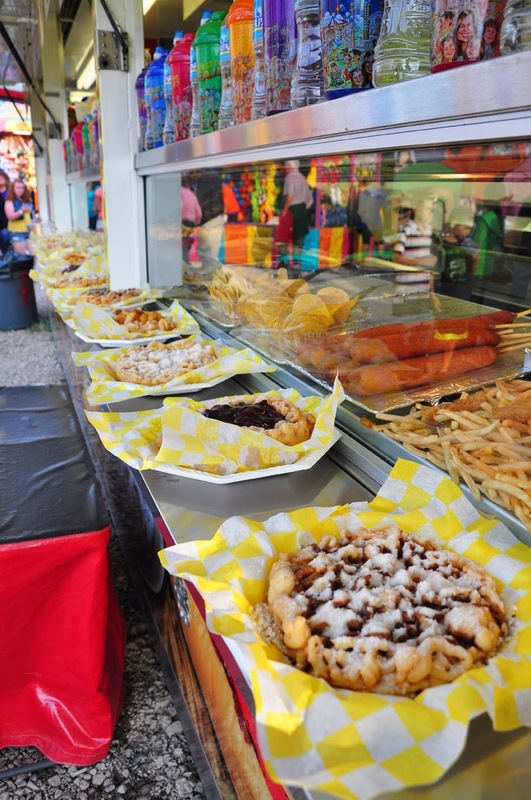 For a mere price of $10 per person, you not only get into the fair but you get all access to all of this including the rides! The rides usually run throughout the day with a small break for an hour or so in the early evening and then back and running until 11pm. Throughout each day, you can usually find some entertainment in the stage booth, derbies and demos each evening and of course, you can stroll through the barns at any time to see all of the wonderful crafts and goodies that people have submitted in the hopes of winning the coveted “Blue Ribbon”. It’s also neat to walk through the animal barns to see all of the animals that are local youth so lovingly took care of and raised and are now proudly displaying for show or sale. 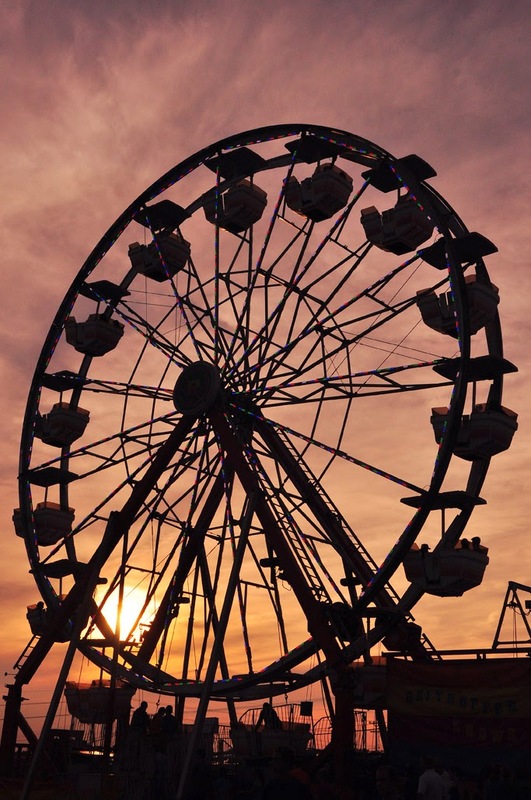 The fair opens tomorrow night for the rides and then all other activities running through the week until the following Saturday, August 2nd! For complete details check out their website. http://www.garrettcountyfair.org/ . It is definitely a fun time for the whole family. We saved you a seat!! If you haven’t booked your Deep Creek summer stay yet then I suggest you hurry up. August will soon be on us but there is still plenty of time to make plans! Water tubing on the lake, hiking at Swallow Falls State Park, kayaking tours with All Earth Eco Tours (www.allearthecotours.com), white water rafting at ASCI or with one of the local rafting companies! There is so much to do! 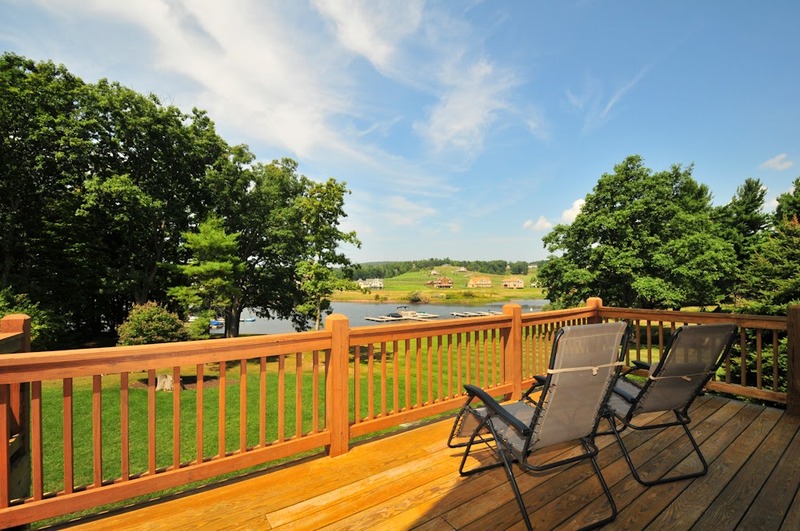 Give us a call at Taylor-Made Deep Creek Vacation & Sales and let us help you find that perfect vacation home. Don’t forget that we now do sales as well and Jay and is here and more than happy to help you find that amazing home for you and your family. Give us a call @ 1-866-351-1119 or online www.deepcreekvacations.com! We can’t wait to see you at the lake! And then there was Olive…. I recently made a big change in my life; I became a dog owner. Yes, this is a big step for many but for me, it was colossal! I am a cat person (we have 4 to be exact!) I was hesitant at first but long story short, here we are months later and Olive has firmly established herself as family. We were sitting around the other day and began discussing our yearly spring family vacation and suddenly it dawned on me; what are we going to do with Olive? With our cats, there was never an issue. They had a cat door, a bowl of food & water and neighbor that just checked on them and kept them refreshed every so often. Clearly, that was not going to work with Olive! Then, I thought rationally and realized I didn’t have to worry about what to do with her; I would take her with us! Yes, many vacation rentals are pet-friendly, as we here at Taylor-Made Deep Creek Vacations & Sales are well aware. 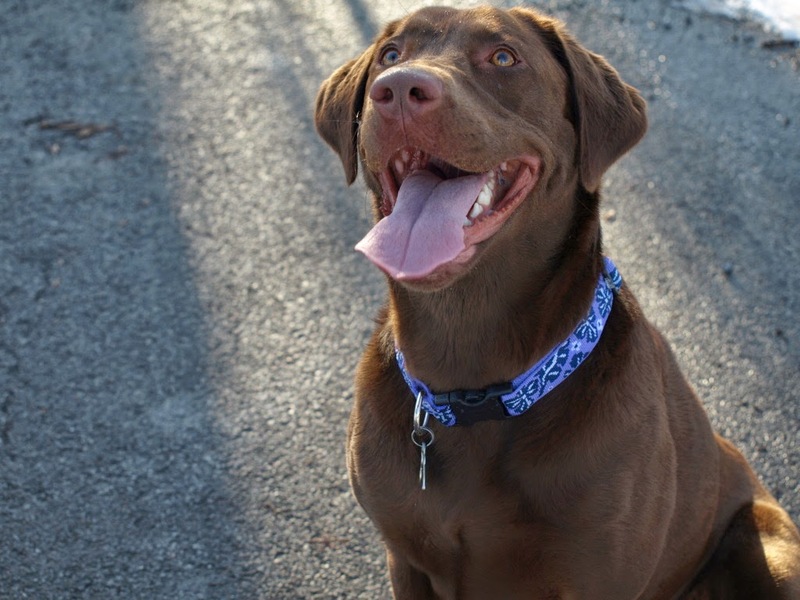 When finding a vacation home, close to half of our guests want to bring their pup! Now I completely understand why, they are part of your family! Why shouldn’t they get to experience fresh mountain air, hiking the many beautiful trails throughout our State Parks or swim and splash in the refreshing waters known as Deep Creek Lake? For an additional fee, many of our homes will allow you to bring 2 domestic, house broken dogs. Did you know that Deep Creek Lake is very pet-friendly? Many of our state parks allow dogs on the walking trails although they do have to abide by a leash law. Pack a picnic lunch and head out for a day of hiking with the family and your furry pal! We also have several dining establishments that allow you and your pet to dine outside on the patio. Enjoy a fresh cold beer and Fire on the Mountain pizza from Mountain State Brewery while dining outside. If you’re lucky, they may have live entertainment that day as they often do. Telli’s Deli offers a delicious array of New York/ Italian style sandwiches, soups, bagels and more. There little tables outside are the perfect place for you and the pup to enjoy breakfast or lunch. These are just to name a few but most of the restaurants that offer outside dining are more than happy to allow you to bring your best friend. So, next time you are planning that family retreat, remember that you do not have to leave your “Olive” behind. Give us a call here at Taylor-Made Deep Creek Vacations & Sales (1-866-351-1119 or online www.deepcreekvacations.com) and let us find you that perfect Deep Creek Lake pet-friendly rental home for your next Deep Creek adventure. Trust me, your best friendly will thank you! We can’t wait to see you at the lake! Visitors to Deep Creek over the Fourth of July weekend were once again awed by another amazing Fire on the Mountain Fireworks display held over Wisp Mountain. Combine that with the incredible blue skies & sunshine and you couldn’t have asked for anything to be more perfect. Today is also one for the record book days with less humidity and a nice light breeze. Ideal weather for The Welcome Party Monday that Taylor-Made Deep Creek Vacations & Sales attends each week. Held on the lawn of Uno’s Pizzeria & The Honi Honi Bar, it’s free and a lot of fun for the whole family. Many of our area vendors set up booths and provide you with some ideas of things to do while you are visiting Deep Creek. Uno’s kindly provides some light refreshments & snacks and there are a lot of chances to win some cool prizes (Not trying to brag here but our gift bag is definitely worth showing up for). Stop by and say “Hi!” and give our wheel a spin to check out your Deep Creek trivia & enjoy a cold sno-cone! We will be waiting! Hard to believe that we are already into the month of July! We are now offering a crazy, can’t pass up Unforgettable Summer Blowout! Reserve our 8 bedroom home Unforgettable for the week of August 16th and receive over $2000 off for the whole week. Sounds crazy, right? But it’s true (I double checked!!) This home has absolutely everything you need for a “Lifetime of Memories” kind of vacation! Well, the 8 bedrooms alone tell you that it can easily occupy your whole extended family! It has a wonderfully large level yard that leads down to your dock slip! The real fun is inside where you have use of the private indoor swimming pool, 2 hot tubs, large flat screen TVs, pool table & more! This really is a phenomenal deal so please call today for complete details! (This won’t last long!) Taylor-Made Deep Creek Vacation & Sales loves to help you and your family plan that special stay so give us a call today (1-866-351-1119 or online www.deepcreekvacations.com). We can’t wait to see you at the lake!